These concepts illustrate how Kallisto Composer can be used to bring various genres to the mobile phone. The screen shots and animated demos are from working midlets that will run on a mobile phone. Using source material from a graphic novel, Kallisto created a demonstration of how a manga story might appear on the cell phone. To take advantage of the phone's capabilities, we "deconstructed" the printed page and re-assembled the story using redrawn color art, separate text and animation. The result is the same story, but retold with greater impact than simply scanning the paper pages and presenting them on the phone. 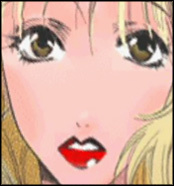 (c) Copyright Misaho Kujiradou, DJ Milky, Courtney Love. Language Bits is a concept demo showing how Kallisto's platform can be used for language instruction and practice. With interactivity, audio and animations matched with high quality art and professional instructional design, Kallisto's platform is a perfect fit for language applications. 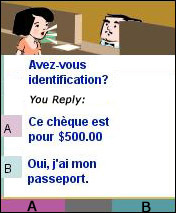 In this concept demonstration, the user gets basic instruction on conducting a bank transaction and can then practice their skills using an interactive scenario. Ugmo is a dog with two owners, one on each side of the tracks. Ugmo provides a comic look at celebrities and trends. Story by Don Priess and Mike Browne. Music by LoudLouderLoudest. © Mike Browne. 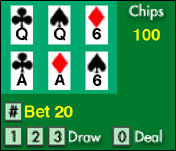 Pinup Poker is an interactive poker game based on 3 card poker. As the player accumulates chips, they win "tickets" to a virtual stage show based on pinup art by artist Greg Hildebrandt. Music by LoudLouderLoudest. Game © 2004 Kallisto Productions, Inc.
Dead Eye Nick is a "Choose Your Path" adventure game based on the exploits of NIck Spade, a private eye trapped in purgatory. You help guide Nick as he and his nephew Morty solve a crime and thereby win Nick's freedom. Along the way you can collect tokens that unlock bonus scenes. Scripted by DigitalArcana. © DigitalArcana and Kallisto 2005.